Darien's Case Matheis (4) controls the ball during the boys lacrosse game against Staples at Darien High School on Saturday, Apr. 7, 2012. Fairfield County is known as a hotbed for lacrosse, so it wasn't surprising to watch three teams from the county win state championships. It's also not a shock that the 2012 Connecticut All-America team features 14 players from Fairfield-based squads. "You look at Connecticut and you see some extremely strong teams, especially in Fairfield County," New Canaan coach Alex Whitten said. "We are seeing a lot more teams in the state crop up and there's definitely more parity in the FCIAC. The sport has really grown across the state." 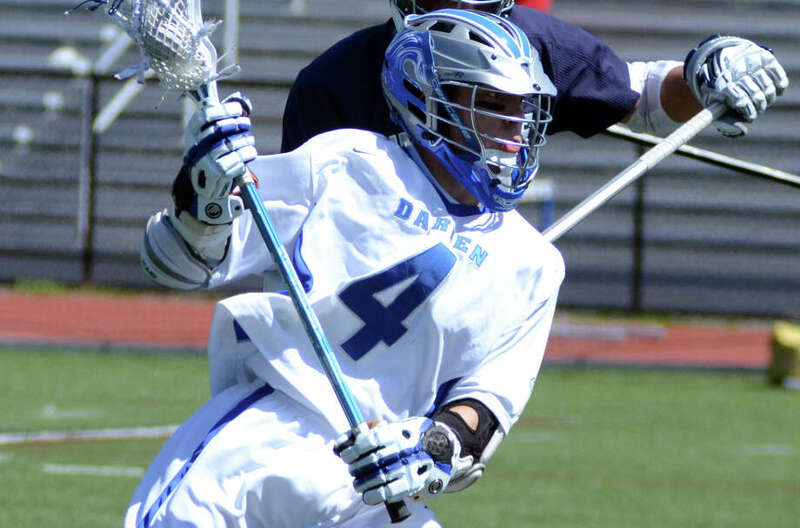 Division M champion Darien had four All-American players in high-scoring attack Case Matheis, midfielder Henry West, defender Tony Britton and long stick midfielder Corey Eppley, all of whom were seniors. Senior midfielder Matthew Brophy, junior attack Kevin Brown and junior defender Andrew Hatton earned All-America honors for Fairfield Prep, which captured the Division L title. New Canaan, which won the FCIAC championship, has a pair of All-American selections in senior goalie Tom Carey and junior defenseman Eric Persky, while senior midfielder Michael Mattson and senior attack Nolan Stauffer made the elite team for Division S champion Joel Barlow. Junior attack Andrew D'Antonio from Brien McMahon, senior attack Chris Nugent of Wilton, junior attack Sean Wilkinson from Ridgefield, senior attack Trevor Gallagher (Simsbury) and senior defender Michael Knapp (Guilford) were also named All-Americans by US Lacrosse. Matheis concluded his brilliant career with 198 goals and 157 assists for 355 career points, all of which were team records. The prolific scorer also tallied a program record 122 points this season. "Case was the premier attackman in the country," said Darien coach Jeff Brameier who guided the Blue Wave to a record of 20-2 and its ninth state championship. "He established new boundaries on what it means to be an attackman and is a classy player who led by example." A three-time All-American, Matheis will play at Duke University next spring. "He has all the tools," Brameier said of his star attackman, who notched 69 goals and 53 assists this year. "His ability to change direction and stop on a dime is unbelievable. That's what makes him tough to stop because no one can overplay him." Despite playing with a hip pointer, Matheis still made clutch plays in Darien's 11-5 win over New Canaan in the M final. "It was a fitting way for him to finish the last tournament of his high school career," Brameier said. "He helped us solidify the state championship win." West, who will play lacrosse at Cornell next season, scored four goals in the Blue Wave's championship victory over New Canaan on his way to championship game MVP honors. "Henry was the strongest shooter I've ever had," Brameier said. "He had a tremendous shot on the run and always stood up strong in the big games." Britton, who will join West at Cornell, anchored the Blue Wave's defense. "Tony had a stellar year in leading our team," Brameier said. "He was our lock down guy who we put on everyone's best offensive player and was a tremendous groundball machine." A standout long stick midfielder headed to Lehigh, Eppley also keyed the defense. "Lehigh's excited about having him because he has great potential," Brameier said. "He is a tenacious player with a lot of ability." Matheis, senior attack Tim Murphy, West, Eppley and Britton also earned First Team All-State honors, while senior midfielder Bobby Weaver, sophomore goalie Phill Huffard and senior midfielder Jon Magnusson made Second Team All-State for Darien. A potent scorer, Brophy tallied four goals in Fairfield Prep's 8-6 triumph over Ridgefield in the Division L final. Brophy was named the Connecticut High School Coaches Association Player of the Year. "He was a pleasure to coach and really epitomized what a student athlete is at Fairfield Prep," said Jesuits coach Chris Smalkais, whose squad also captured the SCC championship and finished 19-4 "He had a no excuses mentality and his leadership ability was outstanding." Brown had two goals and one assist in the L final and three goals and two assists in the SCC title tilt. Hatton, meanwhile, was the Jesuits' anchor defensively. "Andrew was a shutdown defenseman and Kevin played great throughout the season," Smalkais said. Brophy, Brown, junior midfielder David White, short stick defensive midfielder Thomas Brewster and Hatton were named First Team All-State, while junior attack Tim Edmonds, sophomore midfielder Austin Sims and senior defender Charlie Keady made Second Team All-State for Fairfield Prep. Carey, who will play goalie at Bryant College next season, was the MVP of the FCIAC Tournament for New Canaan, which took the league title by beating Ridgefield, 11-9. "Not only does Tom stop the ball well, he's a tremendous athlete outside of the goal," Whitten said. "He made phenomenal outlet passes and clears and even scored two goals. He's one of the best athletes on the team." Persky, who has committed to the University of Pennsylvania, was the Rams' defensive leader. "We had him play the opposition's best attackman," Whitten said. "There's no quit in Eric, who works real hard all over the field. We relied heavily on him all season." Carey and Persky made First Team All-State as well, along with teammates Peter Krauss, a senior attack, and Matt Blasco (senior midfielder). Senior attack Michael Bossidy, senior short stick defensive midfielder Bobby Distler and senior defender Kevin McDonough each made Second Team All-State for New Canaan. Stauffer and Mattson sparked Joel Barlow to the Division S championship. Barlow routed Somers in the title game, 15-2, behind a five-goal, three assist effort from Stauffer and a four-goal, one assist showing from Mattson. "Mattson is a very competitive athlete whose strength is shooting on the run," said Barlow coach John Distler, whose team finished the season ranked No. 2 behind Darien on laxpower.com. "He was also our second faceoff man and did extremely well in that role. "Nolan did a great job of running the offense for us. If you gave him any room or any time he was going to score." Stauffer, Mattson, senior attack Wyatt Tompkins, senior midfielder Matt Billy and senior defender Jackson Sennett were named First Team All-State for Barlow. A three-year starter who is headed to Ohio Wesleyan, Nugent registered 41 goals and 12 assists for Wilton, which advanced to the FCIAC and Division M semifinals. "He started for three years, which is no easy feat," Wilton coach John Wiseman said. "Chris has a high lacrosse IQ and is a great shooter. We're going to miss him. Our team has a good history of having strong attackmen and he continued that tradition." Nugent, senior midfielder Sean Carroll, senior short stick defensive middie Ted Ottens and senior defender Robbie Keers were First Team All-State selections. Junior defender Nick Wells was Second Team All-State for Wilton, which also had Carroll make the Academic All-America Team.